Family Activities, Adventure & Sport! The adventure starts here! Check out the array of family adventure activities and sports available at Trabolgan - the activity adventures holiday centre! Leap from the top of our 12- metre tower and zip down the 100- metre Zip Wire for a truly breathtaking experience. Then Climb your way back up the tower and test your Abseiling skills with a thrilling decent back down again! Enjoy a game of golf at our 18 Hole Par 3 Clifftop Golf Course or why not get the whole family to try their hand at Crazy Golf? And that’s not all! Also enjoy our Indoor Sports Complex and Strike Bowlingo Alley! 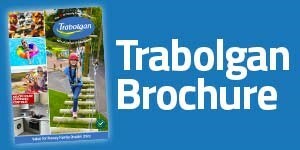 Click here for more on the great range of sports facilities available at Trabolgan! Notes: Age & Height Restrictions Apply on all TAS Activities and are subject to availability. Tas bundles available to resident guests only and must be prebooked 48 hrs in advance of arrival. Suitable clothing (long trousers & long sleeved tops) & suitable footwear must be worn at all times (no open toe shoes or sandals allowed). Long hair needs to be tied back and all jewellery removed. Helmets , harnesses, googles & gloves are provided for certain TAS activities. For more details on timetables, bookings, restrictions speak to a member of our TAS team in the sports hall.